In order to capture a slice of the burgeoning "Baby Boomer" market, Ford's General Manager Lee Iacocca decided to create an affordably priced "youth oriented" coupe, complete with an a la carte options list (a first in the "low priced" segment). To create a buzz for their innovative little 'Mustang', Ford launched the biggest media campaign the automotive world had ever seen. When it finally went on sale (April 17, 1964), buyers responded to the hype by snapping up nearly half-a-million Mustangs in the first calendar year. 40 years later, those 20-something Boomers were now 60-something. So Ford decided to pander to their pension-funded sense of nostalgia, while simultaneously trying to attract younger buyers to the Mustang line. 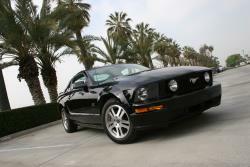 The result was the 2005-2009 S-197 Ford Mustang. And it not only helped to bring a whole new audience into the showrooms, but it almost singlehandedly reignited the infamous Detroit muscle car wars. And if you need some help fending off those pesky Camaros and Challengers, AIRAID has an S197 Ford Mustang GT cold air intake that'll do the trick. 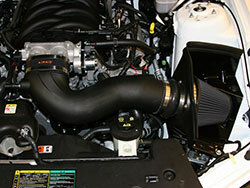 To make a performance splash, the 2005-2009 Ford Mustang GT was fitted with an all-new 4.6L modular V8 engine. The blue oval engineers gave it a special intake system that could vary the air velocity to increase the horsepower and torque depending on the RPMs. 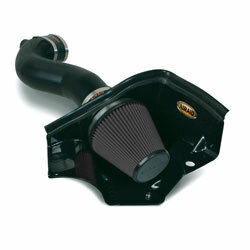 The AIRAID 452-304 MXP high performance intake system is designed to maximize the effect of the 4.6L charge motion control valve system, by delivering a much higher volume of cold air than the OE Ford Mustang intake system can provide. It does this by replacing the restrictive air box with a high-flow AIRAID SynthaMax performance air filter that's surrounded by a unique molded cold air dam. The wide-angle intake tube is also made from the same high density polyethylene material, which is almost completely resistant to heat soak. This means the air charge will remain cool, even as the engine temperatures rise. With the air temperature well controlled, the multi-layer AIRAID Ford Mustang 4.6L performance air filter can remove contaminants from the air, and store them inside the non-woven synthetic material. Thanks to this 'depth loading' design, airflow won't be reduced by a layer of dirt. This dirt will remain inside the filter, until it is time to clean the filter, at 50,000 miles (depending on road conditions). At that point, you can simply wash it out and keep going. All the oxygen-rich air this Ford Mustang performance intake system provides, can then be used by the 4.6L modular V8 to extract more power from the fuel, by burning it more completely. However, the AIRAID 452-304 MXP high performance intake system is a 'Race Only' system, and must be accompanied by an appropriate 4.6L ECU tune. This will adjust the cam timing, spark timing, and modify the fuel/air mixture to work with all of the additional oxygen that this AIRAID S-197 Ford Mustang cold air intake will provide. The actual horsepower and torque improvements will depend on the specific tune that you use, along with the modifications and condition of your 2005-2009 Ford Mustang GT or 2008-2009 Ford Mustang Bullitt.